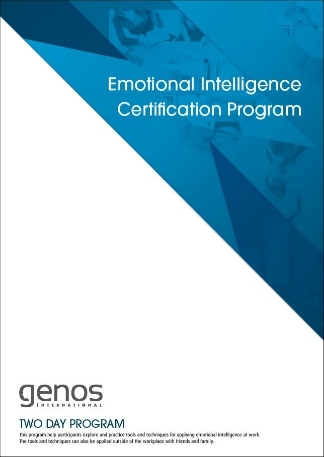 The Genos Certified EI Practitioner Program: become an expert in applying Emotional Intelligence in the workplace. The Genos Certified EI Practitioner Program is specifically designed to make you the expert in applying Emotional Intelligence (EI) in the workplace.. Learn from world-renowned experts who develop and apply Emotional Intelligence with global organisations every day. Our facilitators are the best in their field and work towards making organisations of all sizes become the best model of themselves they can possibly be. The Genos Certified EI Practitioner Program is designed for coaches, consultants, trainers, learning and organizational development professionals, human resource consultants, and organizational psychologists. What's the format of the program? A post-program formal certification qualification session with a Master Trainer: to achieve final formal certification participants must study the 360° assessment of a fictional candidate and debrief those results with the Master Trainer playing the part of the candidate. The Master Trainer provides you feedback on your competence with our 8-step coaching model, and will provide any necessary support to get you feeling completely confident of your ability to effectively debrief reports. Enhance and further develop other individuals and groups emotional intelligence levels through in-depth assessment and debriefing of results, as well as providing the mechanisms necessary for boosting emotional intelligence in the working environment. Affiliation with a world-class Emotional Intelligence researcher and assessment developer. Immediately after certification you are enrolled into our Fast-Start Program – a 12-week video-mail mentoring program helping you establish your Genos business in the weeks following certification. We share everything we use to develop our Genos business in our exclusive Member’s Portal, which gives you immediate access to a wealth of invaluable whitepapers, articles, presentations, marketing material and much more. Undertake the debriefing of no less than three emotional intelligence reports annually. Be present at a minimum of one Genos online Professional Development event annually.